The Bird is the Word | Visit Butler County Pennsylvania! Whether you’re a birding enthusiast or just getting started in bird watching endeavors, there are plenty of avian friends to be spotted all across the county, from north to south. *Note: Since there are so many great birding spots, please travel at your own leisure and refer to our Accommodations and Dining sections for places to eat and rest whenever you’re ready. Be sure to download a free birding handout! Begin your day in Slippery Rock where you can get all of the necessary supplies at The Birdwatcher’s Store on Route 108. Not only is the store itself intriguing, but you can begin birdwatching right there, as it’s located on a 4-acre sanctuary and has a huge back window with birdfeeders outside. 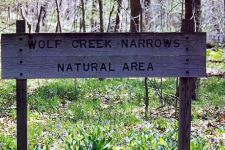 Just a few miles from Downtown Slippery Rock is Wolf Creek Narrows Natural Area. While this green space is most noted for its wildflowers, birds such as Belted Kingfisher, Great Blue Heron, orioles and Wood Thrush can be observed. Seven miles east of Slippery Rock via Keister Road, State Game Lands 95 is a seasonal home to some unusual species such as the Sandhill Crane, American Pipit, Northern Shrike, Rusty Blackbird and the rare Brewer’s Blackbird. A combination of prairie and forest gives Jennings Environmental Education Center a very distinctive ecosystem with an abundance of bird species. Visit around dusk on a spring evening to witness the Woodcock’s amazing mating ritual. Moraine State Park is nearly 17,000 acres and features over 42 miles of scenic shoreline, thanks to Lake Arthur. That being said, Osprey and waterfowl are the main attraction. Learn about Osprey reintroduction while appreciating the gorgeous scenery and wildlife on the Nautical Nature, a 45-passenger enclosed pontoon boat operated by Moraine Preservation Fund. Ever tried urban birdwatching? Visit downtown Butler on a summer night for great views of Common Nighthawks flying around the courthouse. Another location for spotting waterfowl is Succop Nature Park. The conservancy was established to provide an environmental and cultural education center for the community. Two ponds, walking trails, gardens and open natural space allow a variety of outdoor activities. The Cerulean Warbler is known to make its home south of the Monroe Road trailhead of the Butler-Freeport Trail. A variety of other birds can also be seen along the trail, including herons, Belted Kingfishers, Scarlet Tanagers and Indigo Buntings. Last but not least, Todd Nature Reserve is part of Pennsylvania Audubon’s Buffalo Creek Valley Important Bird Area program. Enjoy some of the best bird habitat and most interesting scenery in the area.